KHHI’s long years in the business has successfully achieve a great feat and has managed to earn a lot of loyal and frequent customers who have been regularly buying since they first discovered KHHI. Amongst its many dedicated buyers one of them is Mr. John McCurdy who lives in the US and who himself is a professional knife maker and collector. Over the years he has done many successful projects with KHHI and one of them is the “McKnife Project”, which KHHI named after Mr. John McCurdy. McKnife became an instant hit on its debut and managed to win hearts and hands of hundreds including the collectors and critics in no time. The project was a BIG success and highly inspiring. 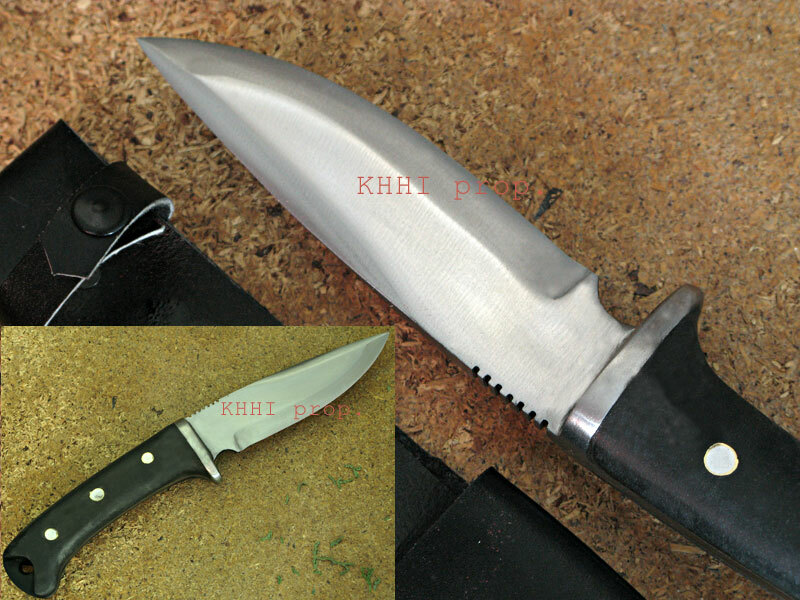 And hence now with the permission from Mr McCurdy, KHHI has also started reproducing the design for its direct selling and thus has added yet another outstanding knife to its amazing product line that we believe would bring joy and thirst to all knife lovers and users. The McKnife’s creative design and superb strength with valuable features make it a complete outdoor knife to carry and carter the needful that would cheat or challenge the fatality about to unfold. The Mcknife is 5 inch long, has a pointed shape and curves gently as it goes towards the point (see photo). It’s has a steep bevel and thus a very sharp edge where as the backside bevel is blunt and has several cuts as shown in the photo. The blade has good temper (54-56 RC) put for hard and rough use and has unpolished finishing objected for the same. 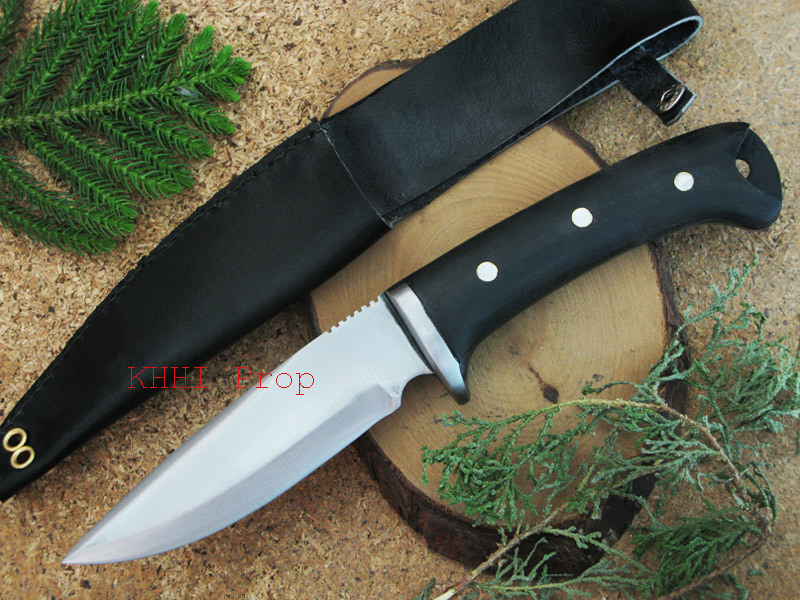 McKnife comes with unpolished finishing water buffalo horn handle. It has a thick full flat tang all the way in which two plates of horns are firmly glued by epoxy and further the fixture is secured by 3 aluminum and brass (washer) rivets. A naked (see through) hole is also avail to facilitate a lanyard motive. This section is made black (anti-rust painted) to repel rust and hence is always hassle free. The steel guard in the top of the handle protects the user’s hand from slipping towards the danger zone (sharp edge). The solid steel guard works like a divider restricting the hand within the handle section – where it must always be. 2 mm ALL leather is used to make it sheath for the first time – simple and strong. Traditional wooden frame is discarded and replaced by this thick leather, as shown in the inset. An extra large belt loop (holder) is made to fit even the biggest ones. The handle belt strap fitted to lock the handle simply makes carrying easier and running swifter. Brass rivets are positioned in the vital parts to ensure that the sheath remains together forever. The blades arrived this day. Wow, you fellas really outdid yourselves. J Am very impressed with everything. Posted photos over at the MTO forums even. Going to post over on my Facebook page once I get better photos from outside. Y’all have interesting paper too. Perhaps I should collect paper samples from the world over too. J Say, is the McCurdy handle made of wood or horn? Thank you again! Will recommend KHHI to anyone. And perhaps we’ll do business again. Good on ya folks!